In 2017, Kendell Beckwith looked like he was on his way to a good, long career at linebacker for the Tampa Bay Buccaneers. He had a fine rookie season. Then he had a terrible car accident that cost him his entire 2018 season — and might cost him 2019, too. 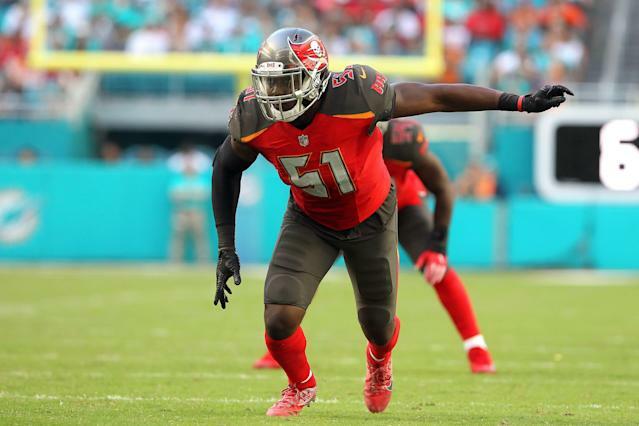 Buccaneers general manager Jason Licht said Beckwith is having an ankle injury suffered in the accident checked by specialists, and it “doesn’t look good for him playing this season,” via Greg Auman of The Athletic. It’s a horrible story, and all due to an accident that could have been avoided. In April 2018, Beckwith let Lamin Barrow, a former NFL linebacker who went to LSU like Beckwith, drive his Camaro, according to a story from Jenna Laine of ESPN.com last November. They were going to the gas station, Laine wrote, and Barrow floored the gas pedal. Beckwith had surgery for a broken ankle. He tried to make it back last season, but hadn’t regained the flexibility in his ankle, Laine wrote. Barrow broke his femur, Beckwith said in the ESPN story. Beckwith lost one season in a promising career, and the Buccaneers apparently fear he might miss all of the next one, too. Beckwith was a third-round pick in 2017 and started nine games. He posted 73 tackles as a rookie. His versatility was a plus. He had some room to grow, but it seemed like he was on the right track. The accident has changed the path of his career. There’s still plenty of time before the season starts, but the pessimism from Licht this early in the offseason is a bad sign. It’s rare for teams to express doubt about a player’s availability for the season in April. The Buccaneers will have to go into next week’s draft assuming Beckwith won’t help them next season. Beckwith is more than a year removed from the accident and still not healed. It’s hard to figure out when, or if, he might be ready to play again.